According to the Scrum Guide, "Scrum is... Simple to understand, Difficult to master." I have never agreed with this statement. 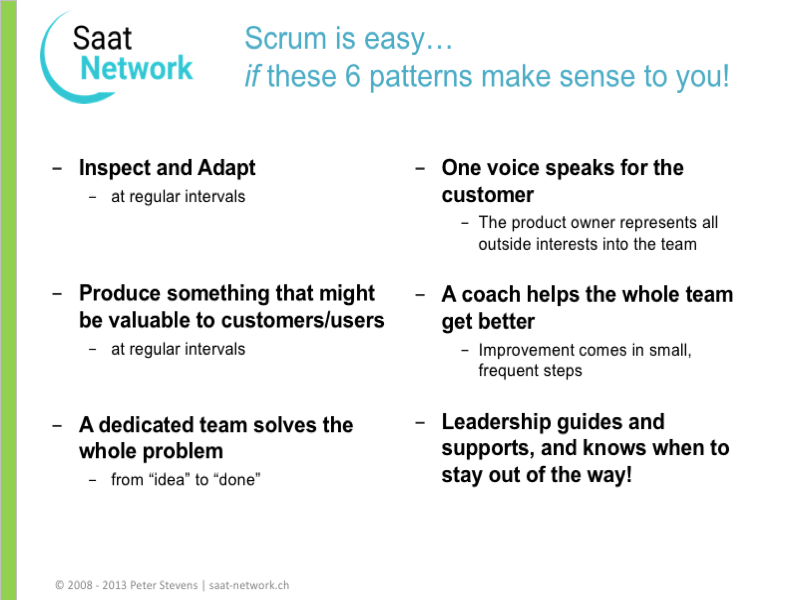 Scrum is easy. I can explain it in 5 or 6 sentences. 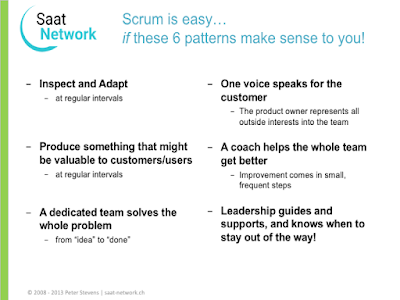 If you agree with the basic principles and design decisions, Scrum makes sense and is very easy to follow. Deliver something of value at least once per month. Many developers and teams are not capable of doing this, and have to learn a lot of new skills. Their organizations are structured around not doing this. Changing this is hard. A team solves the whole problem (from idea to done). This implies feature-teams, but most organizations are organized as component teams, so this implies a reorganization. This is hard. One voice speaks for the customer. The means decision-making about the product is delegated into the team. This fundamentally changes the conversations with the team, from commanding to discussing; from tell to consult, advise and agree; from about what to do to about why and how to do it. This implies rethinking how leadership works, and this is hard. A coach helps everybody get better. This introduces a new role whose value is barely understood to serve people whose value is massively underestimated. Inspect and adapt at regular intervals: this means examining yourself and changing. Inspecting may lead to recognitions that are not consistent with your self-image. When the team discovers something that needs outside help to fix, management is expected to make it happen. Who is now telling whom what to do? This implies taking priority requests from people you used to give orders to. Lots of things about adapting can be hard to do. I think the challenge of doing great things with Scrum is reflected in “the first impediment”: not having a Scrum Team with the skills and authority necessary to be a Scrum team. The PO can’t decide. The Team is not cross functional nor does it own their time or infrastructure. The Scrum Master does not have time or access to management to make improvements happen. Fail before you begin. If you want to get off to a good start with Scrum in your organization, get your management involved to fix or prevent the first impediment! Get the roles right. I believe if you do that, everything else is much easier.